In a Harvard study of selenium, 586 men who developed prostate cancer (CA) during a 13-year follow-up were compared with 577 who were cancer-free. 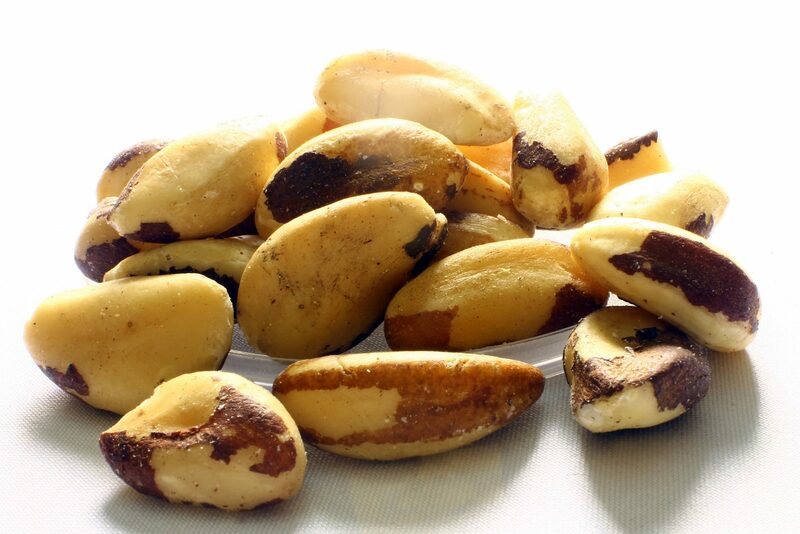 Brazil nuts are some of the best plant-based sources of selenium, though selenium mineral can also be obtained from animal foods, especially seafood. Brazil nut nutrition is not complex: Brazil nuts are actually an edible seed, rich in calories and unsaturated fats, farmed organically as most still come from Brazil where they grow wild in the rain forest, a particularly paleo food, as they have to be wild-gathered. Unlike other tree nuts, all of which lower cholesterol, especially LDL cholesterol, Brazil nuts seem to act immediately. In one study, just four Brazil nuts lowered LDL-c cholesterol within 9 hours. Four Brazil nuts lowered cholesterol the most after 24 hours, from 85 mg/dl to 65 mg/dl, and cholesterol levels stayed down for 30 days! Yes, this study was just 15 people, but wow. That suggests an alternative to starving yourself before getting on the scale, or what to do if you forgot to fast before your low density lipoprotein (LDL or LDL cholesterol) cholesterol test: the nutrition of Brazil nuts! I write more about culinary medicine, and how food works in the body as medicine in Healthy Bytes, our weekly free newsletter. I’ve also written about Brazil nuts and testosterone in REFUEL (a food, fitness and lifestyle way to get healthy and boost low testosterone with fat loss). The health benefits of Brazil nuts include higher than average concentrations of the important minerals magnesium, zinc, boron and of course selenium. These are all needed for steroid and testosterone synthesis, but eating more Brazil nuts is not necessarily better for you. Wjy? Because Selenium can be toxic, if overdone with food or supplements. Chinese research shows that taking nearly 5 mg/day of selenium caused hair and nail loss, skin problems, dental disease and neurologic pathology, 100 times the RDI of 55 micrograms/day, which is in 2/3 of a Brazil nut. Calories per Brazil nut: approximately 30. However, in the Harvard study, those with the highest baseline plasma selenium levels that were not toxic had a 48% reduced risk of prostate CA compared with those men with the lowest levels. And men with PSA scores of less than 4 who had high selenium levels had a far lower risk of prostate CA compared with any others. Higher nail selenium, which is an even more reliable marker of selenium stores in the body than plasma levels, is also associated with lower incidence of prostate cancer (odds ratio 0.29, 95% CI 0.22-0.40) in both nonaggressive and aggressive prostate cancer. Dietary selenium, such as that from Brazil nuts, is readily absorbed, especially from food, and its bioavailability is over 50 percent. Other research shows that men given 200 mcg/d of yeast-based Selenium protected against prostate cancer if they had low levels. The same appears to be true for lung cancer and selenium. The Predimed study suggests that nuts like Brazil nuts measurably improve longevity. Other Brazil nut benefits include being low carb, a natural seed and unprocessed, and relatively high protein as well as tasty. Brazil nut calories are more than most other because they are larger and richer. More than half of U.S. men have less than ideal levels of Selenium. Most men should take 2 Brazil nuts (under 200 mcg) per day. It may even help lower cholesterol, as cited above. If you can, buy Organic Brazil Nuts. It’s one of the only foods that is as easy to take as a pill, and a lot tastier, cheaper, and more effective. Even less expensive: Brazil Nuts in the Shell, by the box.